We are venturing back to the X-Men title to shine the Overvalued spotlight on a seriously overvalued Top Ten issue and to attend to a little unfinished business on X-Men reprints. 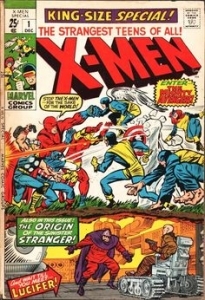 The books in the original X-Men title (#1-66) have always been and still are valued higher than its twin sister book The Avengers (both started in September 1963). There are a few exceptions like Avengers #4 and # 57 that standout but for the most part the X-Men have been valued higher. I had always attributed this to the fact the X-Men were an original group of new characters and first appearances versus the “assembled” group of established super-heroes in the Avengers. Fifty years on I do have a bit of a problem with some of the Overstreet pricing in comparing each of the two titles Top Ten books, but today we are settling on one book – X-Men #8. 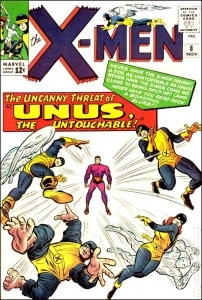 X-Men #8 November 1964 features the first appearance of Unus the Untouchable. His power is a force field which protects him from any harm. He joins the Brotherhood of Evil Mutants and is a regular there. He bounces in to the Marvel Universe here and there but in the end, he is a small-time bit player of an evil mutant. The 46th Overstreet price guide values for X-Men #8 are 8.0 $318 / 9.0 $722 / 9.2 $1125. My problems with the Overstreet price for this book are many but we will limit it to two points. X-Men #9 (Original Avengers crossover) & X-Men #11 (first Stranger appearance) have the same price values as our issue #8. Our issue #8 does not belong anywhere near those two books in terms of price. Avengers #8 introduces Kang the Conqueror a first-rate villain of some stature in the Marvel universe. It comes out in November 1964 as well. The Overstreet price guide values for this book are 8.0 $281 / 9.0 $628 / 9.2 $975. No way X-Men 8 is valued higher than Avengers #8! A 20-25% hair cut is in order for the value of our X-Men #8 in my humble opinion. In my first Overvalued Overstreet post, over in Arcs & Runs, the subject of my Overstreet ire was the X-Men reprint issues #67-93. I did however forget that there were two other overvalued reprint books and I wanted to bring them to your attention. In fact, I believe one of them is the worst of the bunch. 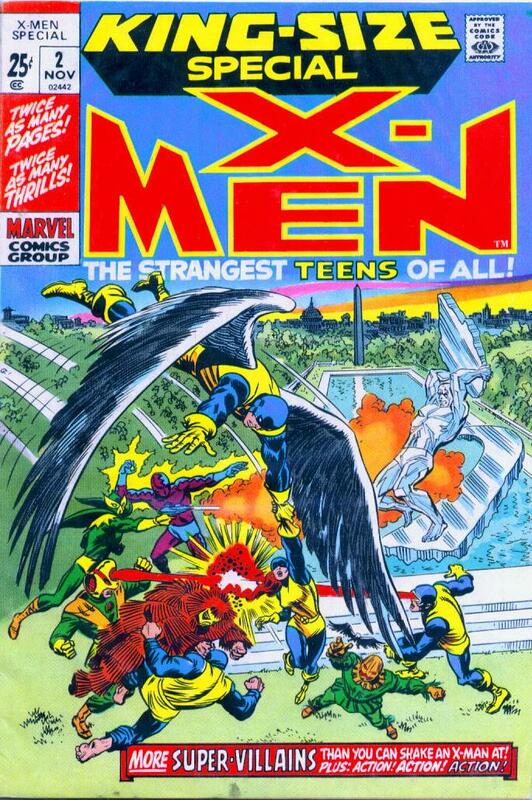 X-Men King-Size Special #1 December 1970 is my candidate for the most overvalued of the X-Men reprint books. I think I have owned it three times ^-^. 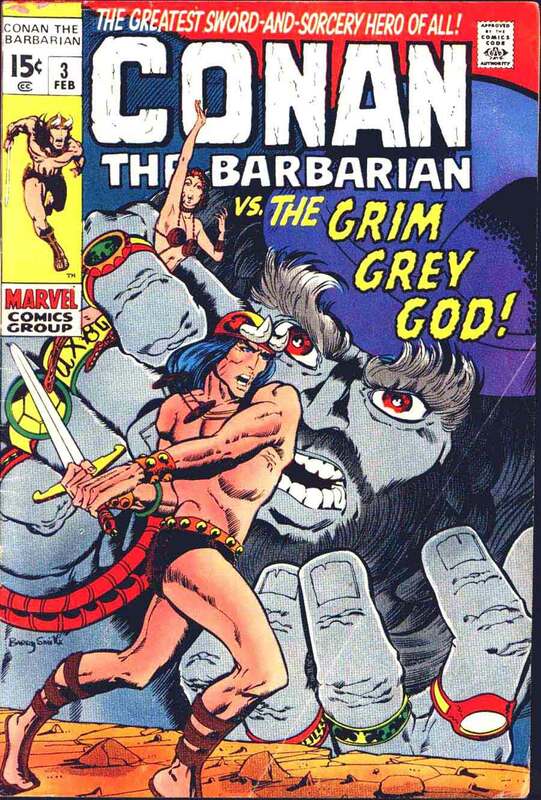 This book was printed in the same month as X-Men #67 and began the reprinting cycle for the title. 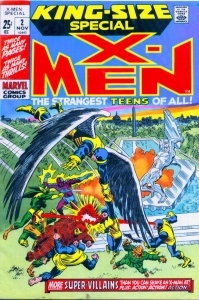 It features reprints (ironically) of X-Men #9 (featured on the cover) and X-Men #11. The 46th Overstreet Price guide values are 8.0 $66 / 9.0 $138 / 9.2 $210. These are the highest prices on any of the reprints. To give it a bit of prospective Amazing Spider-Man King Size Special #7 came out the same month and featured reprints from Amazing Spider-Man #1, #2, and #38 and had original art on the cover. 46th Overstreet Price guide values are 8.0 $35 / 9.0 $63 / 9.2 $90. Nuff Said! X-Men King-Size Special #2 November 1971 features reprints of X-Men issues #22 and #23 and features new cover art. The 46th Overstreet Price guide values are 8.0 $51 / 9.0 $96 / 9.2 $140 which are the same as X-Men issues #71-93. The prices for all of these X-Men reprint issues have stayed the same for a few years now, they are pretty much dead money (not counting super-high grade) and as close to a price decrease as you will get in Overstreet. I promise not to write about these X-Men reprints again! See you next month. Thanks AFTA! Your comments echo what I have seen and done myself with these books in the past. I do think the best days for these books, are for the most part in the rear view mirror. High grade copies of these books still sell today though, largely for the reasons that you pointed out. I’ve always assumed that the X-Men King-Size specials were basically Annuals #1 and #2, since officially, the X-Men Annual begins at #3. As noted above, I had to pick these up in order to complete my run of annuals. Out in the wild, the prices for these books are all over the map but mid to lower grade copies can be had pretty cheap, which to me is the sweet spot for these type of books. Mike, you have my endorsement to work at Overstreet! I have to add a few things (Hey, I talk for a living and can’t help myself!) Some of the covers on Issues #73-80 are my all-time favorite covers for the X-Men with #76 being the #1 spot! Marvel Called all their annuals “King Size Specials for a period of time and of course they became the Annuals that we know today! 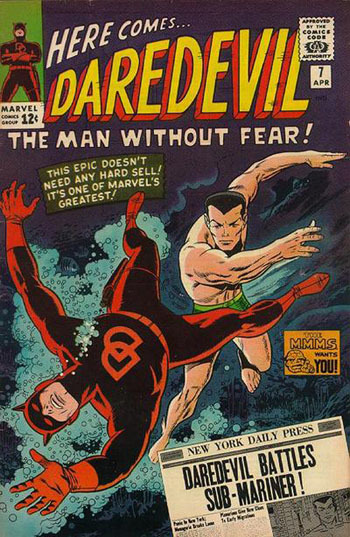 One last thing (“Please, oh please let this be it!”) If I had to sell of my entire Marvel collection, the Square bounds from the 60’s and 70’s would survive the cut! They just look and feel so beautiful!!! I think you are right on in terms of picking up mid-grade copies of these X-Men re-prints. I have a seen number of these in the $12-25 range at stores, and if you need to finish the run, these would be the type and grade of books I myself would target. Marvel seamed to jump back and forth between calling these books “Specials or Annuals” . I always thought of them as annuals. Thanks for the endorsement Charlie – i think ^-^! Hey Mike….I felt the King size Xmen specials # 1 and 2 and the Kazar special featuring an Xmen cross over (also a reprint) not only kept the X-men legacy alive but also introduced the Xmen characters to a whole new generation of Marvel fans. Marvel was only 9 to ten years old at this time. In retrospect this laid the groundwork for Giant size Xmen #1 and the eventual success of the Xmen becoming Marvels most important property for 20 or so years. The color and layouts of those covers remains unmatched. Id overpay for those beauties anytime !! Thanks for the walk down Memory lane Mike. 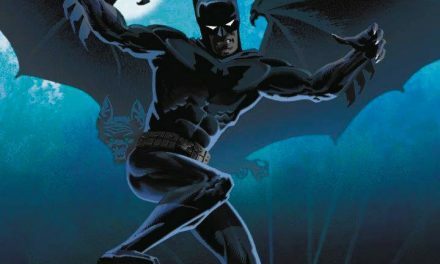 Nice seeing you recently at Big B.
Hi Dave, Yes great seeing you as well and talking comics with Walt. The X-Men reprints did keep the team in the comic readers mind. I have to agree with AFTA and yourself in the appeal of the cover art. I too loved X-Men #73-80 and the X-Men #2 special.. X-Men #76 was my favourite as well. 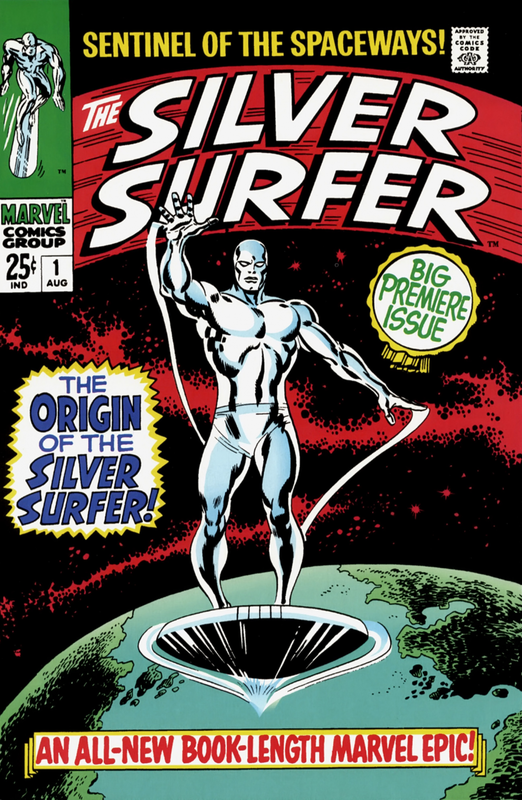 Mostly Gil Kane work, and he did a lot of great cover art in that early seventies time frame . I still think they are priced too high for what they ultimately deliver. If I had to buy them to complete the set I would follow Charlie’s example and buy nice looking mid-grade copies. Thanks for the comment Dave.